It’s International Day of the Girl today and we’d like to introduce you to Adelphine…Adelphine leads a child-headed household in Rwanda at just 20 years old. Life is difficult but she stands proudly behind the counter of the general store. Her general store. She is a girl from a rural village, orphaned at 7 and barely literate. She finished school before entering her teens, without family to support her and an urgent need to earn enough money to survive. She describes life at that time as ‘a life of suffering’. Without hope or choices. Then she hears about a business training school teaching business skills to youth. Just like her. She enrols and graduates yet lacks the confidence or support to implement what she has learned. But the next step is coming. It’s a Youth Self Help Group (SHG) starting in her village. An opportunity to join twenty other young people just like her: alone, unable to provide for themselves, embarrassed and ashamed by their poverty. So, she took the big step of joining a SHG. For life. Coming out from behind her loneliness and shame in the hope of finding friendship and support. The first six months she spent taking part in weekly meetings including a wide range of training: finance and entrepreneurship, money and loans, goal setting, conflict resolution. So many skills that she lacked but soaked in enthusiastically. Along with the other group members, she saved tiny amounts of money, that became the lending pool for business ventures. Then, six months later she took a loan from the SHG to start a small business. Buying and selling products like avocados, tomatoes and bananas. Business went well but it was hard work. Early rises, standing in the hot sun. And she started to dream of something different. A shop. A shop in the village. 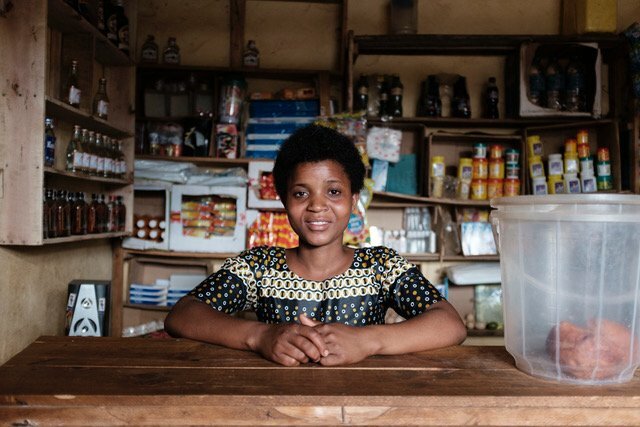 It seems impossible but only four months after starting her business selling at the market, Adelphine took another loan to take a lease on the general store. Right in the middle of her village. With a room in the back to live. It’s small and basic but she is so proud of her progress. Every day she works from 6am to 8pm. Seven days a week with barely a break for her lunch and evening meal. But she is not resentful – she is making great strides. She is economically independent, socially connected and accepted by friends and the local community.